Ferro-manganese (Fe-Mn) is an important additive used as a deoxidizer in the production of steel. It is a master alloy of iron (Fe) and manganese (Mn) with a minimum Mn content of 65 %, and maximum Mn content of 95 %. It is produced by heating a mixture of the oxides of Mn (MnO2) and iron (Fe2O3) with carbon (C) normally as coke or coal. Fe-Mn in a blast furnace (BF) with considerably higher Mn content than was possible earlier was first produced in 1872 by Lambert Von Pantz. The Fe-Mn produced had 37 % Mn instead of 12 % being obtained earlier. Metallurgical grade Mn ores having Mn content higher than 40 % are usually processed into suitable metallic ferro- alloy forms by pyro-metallurgical processes, which are very similar to the iron pyro-metallurgical processes. In its production process, a mixture of Mn ore, reductant (a form of C) and flux (CaO) are smelted at a temperature which is higher than 1200 deg C to enable reduction reactions and alloy formation. Standard grades of Fe-Mn can be produced either in a BF or in an electric submerged arc furnace (SAF). The electric SAF process, however, is far more flexible than the BF process, in that slags can be further processed to Si-Mn and refined Fe-Mn. The choice of process is also dependent on the relative price of electric power and coke. In a three-phase SAF, the electrodes are buried in the charge material. The raw materials are heated and the Mn oxides pre-reduced by hot carbon mono oxide (CO) gas form the reaction zones deeper in the furnace. The exothermic reactions contribute favourably to the heat required. Efficient production of HC Fe-Mn depends on the degree of pre-reduction which occurs in the upper region of the furnace. There are several grades of Fe-Mn which are divided into many groups. The three main groups are high C Fe-Mn, medium C Fe-Mn, and low C Fe-Mn. High C Fe-Mn can be made in BF and in SAF. In SAF it is made by two different practices namely (i) high Mn slag practice, and (ii) discard slag practice. Medium C Fe-Mn can be produced by a de-carbonation process or through a redox (reduction-oxidation) reaction between silicon (Si) in the silico-manganese (Si-Mn) alloy and Mn ores. Low C Fe-Mn is produced by the reaction of Mn ore and low C Si-Mn. The raw materials needed for the production of Fe-Mn are Mn ores, coke and fluxes such as limestone, dolomite and quartzite. The raw materials are often stored outdoor, and the water content, including chemically bound water in the Mn ores, may therefore be high, up to 10 %. Mn ore is an important raw material used in the production of Fe-Mn. Mn ores are classified according to their contents of Mn. In general, ores containing at least 35 % Mn are classified as Mn ores. Normally, there are three grades of Mn ore based on their Mn content. These are (i) high-grade Mn ore with Mn content of 44 % to 48 %, (ii) medium grade Mn ore with Mn content of 35 % to 44 %, and low grade Mn ore with Mn content of 25 % to 35 %. Ores with Mn content of 10 % to 35 % are called ferruginous Mn ores while the ores with Mn content of 5 % to 10 % are called manganic-ferrous ores. Ores containing less than 5 % Mn with the balance mostly Fe are classified as iron ores. The coke needed for the production of Fe-Mn in SAF is to be more reactive than those normally used in the iron BF. Highly reactive coke when used in a SAF results in stable furnace operation which gives good productivity. Blast furnaces were widely used in developed countries for the production of Fe-Mn, up to the end of World War II. Normally, integrated steel plants destined their smaller BF for the production of high C Fe-Mn. Low grade Mn ores with a Mn content of minimum 28 % can be used for smelting in the BF. High C Fe-Mn is produced in a BF in a process which is similar to the process of producing hot metal (HM) in BF. However there are some important differences between the two processes. The iron oxides are reduced by CO in the shaft region of the furnace according to the following reactions. On the other hand, Mn oxides are reduced by solid C in the bosh and hearth regions of BF since higher temperatures are due to the following reactions. Hence, the production of Fe-Mn in a BF needs larger amounts of coke than needed for HM production in the BF. Preheating of the blast and oxygen (O2) enrichment are usually used to reduce the requirement of coke. Dolomite or limestone added to the charge raises the activity of MnO for reduction. Small slag volume, basic slag and high blast temperature are required for the higher recovery of Mn. By careful control and a more uniform charge mix in the shaft of the BF, recoveries of Mn over 90 % and coke rates of 1530 kg/t have been achieved. Top gas in BF producing the Fe-Mn entrained excessive fines. SAF has replaced BF because of smaller coke rate, longer refractory life, no need of hot blast, and reuse of MnO-rich slag for the production of Si-Mn ferro-alloy. In the case of the production of high C Fe-Mn in a BF, thermal energy needed for the process of the smelting is supplied by the combustion of additional coke, while in case of production of high C Fe-Mn in a SAF, thermal energy needed for the process of the smelting is supplied by the electric power. Capital expenditure needed for a new facility is also lower in case of SAF. Important design parameters of a SAF for high C Fe-Mn production are (i) electrode diameter and spacing, (ii) diameter of the furnace hearth, (iii) depth of the crucible, (iv) voltage range, and (v) MVA capacity of the transformer. Because of the low resistivity of the burden in the production of Fe-Mn, low voltages between the electrodes are necessary to maintain satisfactory penetration of the electrodes in the charge. Hence, for obtaining of the proper power loading for the furnace, higher currents are needed. Thus, to operate within the current carrying capacities of C electrodes, the diameter of the electrodes for the SAF producing Fe-Mn is higher than the SAF producing other ferroalloys. Electric energy is supplied for the smelting reaction through three carbon electrodes, which are normally of self-baking, type. The crucible consists of a steel shell lined with refractory bricks and an inside lining of C blocks. The hearth is similar to BF, but has a thicker C lining. The height of the shaft of a SAF is much less than that of an iron BF and the residence time of the burden in the shaft is proportionately less. Typically, reduction of oxides to metal is to be performed in a few hours compared with 6 to 8 hours in an iron BF. Use of a reactive coke in SAF production of Fe-Mn allows the iron oxide to be reduced to metal, the higher oxides of Mn to be reduced to MnO and a small amount of the MnO to be reduced to Mn dissolved in iron by the time the burden reaches the mixed slag-coke layer below the electrodes. The lower height of the shaft relative to that of a BF also means that the strength of coke is a less critical property in SAF smelting of Fe-Mn than in the iron BF smelting. The SAF producing Fe-Mn can have either open top or closed top. Open top furnaces have a fume collection hood at least 1 meter above the top of the furnace shell. Moveable panels or screens are sometimes used to reduce the open area between the furnace and hood, and to improve emissions capture efficiency. CO gas rising through the furnace charge burns in the area between the charge surface and the capture hood. This substantially increases the volume of gas which the containment system is required to handle. Additionally, the vigorous open combustion process entrains finer material in the charge. Fabric bag filters are typically used to control emissions from open top furnaces. Closed top SAF (Fig 1) usually has a water-cooled steel cover which fits closely to the furnace shell. The objective of closed top furnaces is to reduce air infiltration into the furnace gases, which reduces combustion of the gases. This reduces the volume of gas requiring collection and treatment. The cover has holes for the charge material and electrodes to pass through. Closed top furnace which partially closes these hood openings are referred to as ‘mix-sealed’ or ‘semi-enclosed furnace’. Although this type of closed furnace significantly reduces air infiltration, some combustion still occurs under the furnace cover. Closed top SAF which has mechanical seals around the electrodes and sealing compounds around the outer edges are referred to as ‘sealed’ or ‘totally closed’. This furnace has little, if any, air infiltration and undercover combustion. Water leaks from the cover into the furnace must be minimized as this leads to excessive gas production and unstable furnace operation. Products prone to highly variable releases of process gases are typically not made in close top furnaces for safety reasons. As the degree of enclosure increases, less gas is produced for capture by the hood system and the concentration of CO in the furnace gas increases. 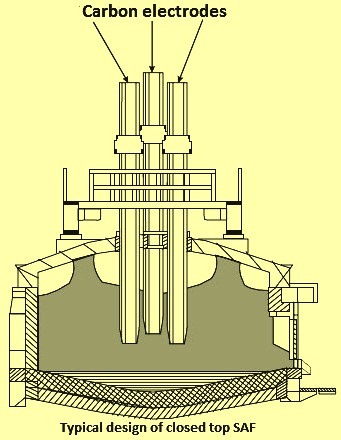 Wet scrubbers are used to control emissions from closed top SAF. The scrubbed, high CO content gas can be used within the plant as a fuel or flared. The closed top SAF allows better fume control at lower capital cost and lowers the energy requirement. On the other hand, the requirements for ore used in closed top furnace are more restricted, e.g. free O2 must be less than 10 % and less friable ore. Otherwise, crust can be formed leading to occurrence of explosion. The economic performance for the production of Fe-Mn is improved by selecting the proper raw materials suitable for the closed top SAF, applying the best material balance for the raw materials and enhancing the smelting condition. These result into lower consumption of raw materials, reduced specific energy consumption, good furnace operation, higher alloy quality and lower production cost. The reactions and changes in the burden materials during the production of high C Fe-Mn in a SAF have been better understood by studying extensively the frozen furnace which was excavated at the Meyerton Fe-Mn plant in South Africa in 1977. These studies provided considerable understanding of the changes in the burden materials and the nature of the reaction zones. The excavation revealed that the interior of the furnace can be divided into nine zones of which three appear to be of most importance for the reduction and metallurgical processing. These are (i) a cone of fast descending burden around each electrode, (ii) a coke bed directly below the electrodes, and (iii) a mixed coke-slag layer beneath the coke bed. The major revelations of the excavation were that between temperature in the range of 1300 deg C and 1600 deg C reduction occurred in three main stages, namely (i) rapid reduction of higher Mn oxides to MnO and of hematite to metallic Fe (in the solid state) by CO gas and formation of a primary slag consisting mainly of CaO and SiO2, (ii) dissolution of MnO into the slag and reduction at the surface of ore lumps to form metallic beads, and (iii) reduction by lump C in contact with molten slag. Carbo-thermic reduction of MnO and FeO are endothermic reactions but MnO reduction requires more heat than FeO reduction as given in the following reactions. MnO reduction also requires a higher minimum temperature. The reduction temperature for MnO is 1400 deg C and that for FeO is 720 deg C. In practice, the thermodynamic activities of Mn and Fe are less than unity due to alloy formation so the actual minimum temperatures are slightly lower. In the production of Fe-Mn, thus, it is thermodynamically possible for the iron ore to be reduced to Fe, the higher Mn oxides to be reduced to MnO, and some of the MnO to be reduced to Mn dissolved in the metallic Fe (at low thermodynamic activity) in the solid state under the conditions in the shaft using the sensible heat and reducing capacity of the gases produced in the slag-coke zone. This leaves only the reduction of the remaining MnO to occur in the high temperature mixed slag-coke zone. The rate of reduction of Fe oxide to metal and the reduction of the higher oxides of Mn to MnO are strongly controlled by the Boudouard reaction (C+ CO2 = 2CO) under conditions that exist in the shaft of the SAF at temperatures up to around 1300 deg C. The rate of reduction of MnO to alloy is much less controlled by the Boudouard reaction since, at temperatures (greater than 1300 deg C) where most of the MnO is reduced, the reactivity of the coke, irrespective of the initial values tend to converge to broadly similar values. The reduction of the highest Mn oxide (MnO2) occurs in four steps. The first reduction step from MnO2 to Mn2O3 (4MnO2 = 2Mn2O3 + O2) is reached at a temperature of greater than 450 deg C to 500 deg C and the second step Mn2O3 to Mn3O4 (6Mn2O3 = 4Mn3O4 + O2) at greater than 900 deg C to 950 deg C and that both can be realized without reducing agent and only by the thermal decomposition. Both steps in the thermal decomposition show the range of the Mn oxide’s stability. The reduction of Mn3O4 to MnO (Mn3O4 + CO = 3 MnO + CO2, and Mn3O4 + C = 3 MnO + CO) is only possible by CO gas or solid C. The reduction of MnO by carbon at atmospheric pressure is only feasible at temperatures greater than 1410 deg C. To achieve full reduction the temperature needs to be even higher. The problem here is the high vapour pressure of Mn and its resulting strong evaporation. In the case of the Mn production process with its various reduction steps, MnO first dissolves in the slag phase from which Mn is reduced by solid C and moves into the metal phase. Here the non-ideal solutions of slag and alloy are of great importance. Up-to-date thermodynamic methods are to be used to determine phases and the energy balance based on the mass balance. The more reactive coke which is used for the production of Fe-Mn in a SAF enables Boudouard-controlled reactions to be completed higher in the shaft, thereby more effectively utilizing the sensible heat and reducing capacity of the gases from lower in the furnace, and enabling the final, high heat demand reduction of MnO to Mn to be the major reaction in the high temperature mixed slag-coke zone. Conversely, less reactive cokes may lead to poor reducing conditions and larger coke beds in the furnace, resulting in poor furnace control, unstable alloy and slag compositions, and higher power consumption. An important consideration for a successful smelting operation is the composition of the slag, since it has distinct effects on furnace resistivity, smelting temperature, recovery of the Mn, and the amount of Si in the Fe-Mn. Blending of ores or the addition of fluxing reagents is often necessary to produce the desired slag composition. Two types of the slag practices are normally used for the production of Fe-Mn in a SAF. These are (i) high Mn slag practice, and (ii) low Mn slag practice also known as ‘discard slag’ practice. The high Mn slag practice is generally preferred by those plants where high grade Mn ores are smelted and Si-Mn is also produced. Mn content of this slag ranges from 28 % to 40 %. Typical % ranges of the other compounds in the slag are (i) MgO -3 % to 8 %, (ii) Al2O3 – 10 % to 30 %, (iii) CaO – around 15%, and (iv) SiO2 – 25 % to 28%. These slags are generally used in the production of Si-Mn, thus increasing the overall recovery of Mn. Small amounts of fluxes such as dolomite or limestone are also used depending on the desired Mn concentration in the slag. The discard slag practice is followed when the quality of Mn ore is very low. Because of low quality of the Mn ore, a high degree of Mn extraction is needed to achieve the desired Mn content in the Fe-Mn alloy. Also when the Mn ore contains basic oxides such as CaO and MgO, and if such ore is smelted alone, then it leads naturally to low Mn slags. Mn content of the slag from this practice generally ranges from 10 % to 20 % and the recovery of Mn in the Fe-Mn alloy is in the range of 80 % to 90 %. Typical % ranges of the other compounds in the slag are (i) MgO -3 % to 8 %, (ii) Al2O3 – 4 % to 10 %, (iii) CaO – around 35%, and (iv) SiO2 – 28 % to 32 %. If the Mn ores contain only a low amount of CaO or MgO, the furnace charge is then made up of Mn ores, coke, and basic fluxes such as limestone or dolomite. Better results are obtained when the required basic oxides (CaO or MgO) are contained in the Mn ores. Power requirement in discard slag practice is higher than needed for the high Mn slag practice because of the additional energy needed for the calcining of dolomite or limestone in the charge and the greater amount of Mn extracted from the slag which results in higher CO content in the off-gas than in that of the high Mn practice. Medium C Fe-Mn contains 1 % to 1.5 % C and has Mn content in the range of 75 % to 85 %. Medium C Fe-Mn can be produced either by refining high C Fe-Mn with O2 or by the silico-thermic route, where the Si in Si-Mn is used to reduce additional MnO added as ore or slag. Refining of high C Fe-Mn with O2 – The process is also known as the manganese oxygen refining (MOR) process and is patented by Union Carbide. In this process high C Fe-Mn is decarburized in a similar manner as is done in the steelmaking process in the basic oxygen furnace (BOF). However, there are several distinct differences in the case of refining of the Fe-Mn. These differences are (i) a final temperature of 1750 deg C is needed compared to 1650 deg C required in steelmaking, (ii) more severe attack on the refractory, (iii) difficult casting of the final alloy, (iv) higher vapour pressure of Mn, and (v) higher volume and temperature of the off-gas. In the MOR process, O2 is blown into the molten high C Fe-Mn and the temperature is increased from its tapping value of 1300 deg C to 1750 deg C. The heat required is supplied by the oxidation of Mn to Mn oxide and C to CO. In the early part of the blowing process, most of the O2 is consumed by oxidation of Mn, and the temperature of the melt increases from 1300 deg C to 1550 deg C. Here after, C is rapidly oxidized and the temperature rises to 1650 deg C. Above this temperature, the rate of C removal decreases and Mn is once again oxidized. The process is stopped at 1750 deg C, which corresponds to a C content of 1.3 %. Further reductions in C content result in unacceptably high losses of Mn. In the MOR process, the recovery of Mn is around 80 % and the distribution of Mn can be broken down as (i) MC Fe-Mn alloy 80 %, (ii) fume formed by vaporization 13 %, (iii) slag formed by oxidation of Mn 5 %, and (iv) other losses, splashing etc. 2 %. The successful operation of this process depends on the design of the blowing vessel and O2 lance as well as giving careful attention to operational procedures. The MOR process has many advantages over the silico-thermic process which includes lower energy consumption, lower capital investment, lower production cost, and greater flexibility. The main disadvantage of the process is that its use is limited to production of medium C Fe-Mn because the C content cannot be reduced to below 1.3 %. Silico-thermic route – In the silico-thermic route for the production of medium C Fe-Mn, a high grade slag or a melt containing Mn ore and lime (CaO) is contacted with Si-Mn containing Si in the range of 16 % to 30 %. The Si in the alloy acts as the reducing agent in the process, which reduces the Mn oxide in the melt according to reaction Si + 2MnO = SiO2 + 2Mn. The purpose of the lime is to reduce the activity of the SiO2 in the melt, thus forcing the above reaction as far to the right as possible. The basicity ratio (CaO/SiO2) in the slag is to be greater than 1.4 for a sufficient reduction in the activity of SiO2. The C entering the process in the Si-Mn remains entirely in the metal phase and is therefore found in the product. Thus, to produce a medium C Fe-Mn containing 1 % C, a Si-Mn containing 20 % Si is necessary. The heat produced by the silico-thermic reduction is not sufficient to sustain the process. Hence it is normally carried out in an electric arc furnace (EAF). This EAF is lined with magnesite bricks, which are fairly resistant to the highly basic slag. The EAF can be tilted so that the slag can be separated from the metal. Although the silico-thermic reduction process is more energy intensive than the decarburization of high C Fe-Mn, it has the advantage that the final C content is limited only by the C content of the initial Si-Mn. The silico-thermic process can therefore be used to produce low C Fe-Mn and industrial Mn metal. Low C Fe-Mn contains Mn in the range of 76 % to 92 % and C in the range of 0.5 % to 0.75. The production of low C Fe-Mn is not possible by the decarburization of high C Fe-Mn without extremely high losses of Mn. It must accordingly be made of a silico-thermic reduction process. The process is similar to that used in the silico-thermic production of medium C Fe-Mn. High-purity ores are used and in particular ores containing Fe and P are to be avoided. An artificial Mn ore produced as a high grade ore is particularly suitable because of its low impurity level and because all the Mn is present as MnO. The reduction of the higher oxides of Mn is therefore unnecessary. The typical consumption figures per ton of low C Fe-Mn ferromanganese having composition of Mn – 85 % to 92 %, C – around 0.1 %, and Si around 1 % with a manganese recovery of 75 % are calcined Mn ore – 1250 kg to 1350 kg, Si-Mn (containing 32 % to 33 % Si) – 800 kg to 850 kg, quicklime – 1000 kg to 1100 kg, electrodes – 10 kg to 12 kg and electric power – 1800 kWh to 2500 kWh.